The annual Muston Scarecrow Festival took place last week in Scarborough, North Yorkshire, UK. Unfortunately, one of the most popular scarecrows, a depiction of Prince, was stolen last Friday night. 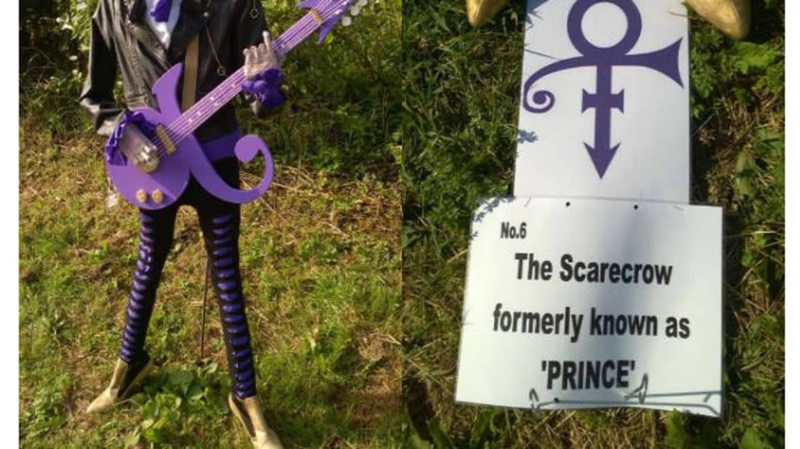 The contest organizers had a bit of fun with the gold-painted shoes left behind, and added a sign renaming the work as “the scarecrow formerly known as Prince.” And despite the fact that it went missing, the scarecrow was awarded tenth place in the competition. See more photos of the scarecrows that competed at Facebook. Both George Jones and Vince Gill sang about driving a lawnmower while drunk, but that won’t stop police from arresting you. An unidentified man in Massillon, Ohio, was stopped by police last Friday while driving a riding lawnmower through town. The arresting officer asked the man to walk, and when he tried, he was too intoxicated to stay on his feet. The suspect’s name was not released, but police say this incident is his sixth DUI. The man said he was driving a lawnmower because his driver’s license was suspended. The drunk driving charge is a misdemeanor this time, because the previous DUI charges took place over more than a 20-year period; otherwise he would have earned a felony charge. Kate Vershov Downing was the Planning and Transportation Commissioner for the city of Palo Alto, California, until Wednesday. She’s also a lawyer for a tech firm, and her husband is a software engineer. She resigned her position on the city council this week because they’ve decided they cannot afford to raise a family in Palo Alto, and are moving to Santa Cruz. The average rent in Palo Alto was $3,463 in the second quarter of 2016, according to a report last month from Novato-based RealFacts. In June, the median price of a single-family home was $1.2 million in San Mateo County and $982,500 in Santa Clara County, according to the CoreLogic real estate information service. Downing and her husband had been sharing a rental house with another couple and splitting the $6,200 monthly rent. She made her resignation letter public to draw attention to the difficulty of finding affordable housing in Silicon Valley. Jeffrey Brown of Memphis was inside a cell phone store when he saw a tow truck ready to haul away his car! The tow truck driver was there to repossess the vehicle. While the tow truck driver was out taking pictures of Brown’s vehicle, Brown and his companion Alexius Golliday got into the tow truck and drove away. The couple managed to unhook the car on a nearby street, then drove it through two yards. Brown then tried to flee on foot, but was captured. Brown is facing charges of theft, evading arrest, and driving on a suspended license. Golliday was charged with a probation violation. Jeni Stepien’s father, Michael, was murdered ten years ago when she was a teenager. He was an organ donor, and his heart went to Arthur Thomas, who had been waiting for a donor heart for 16 years. Michael Stepien’s family knew about Thomas, and has been corresponding with him since the surgery. But they lived in different states, and did not meet until this past weekend. On Friday, Jeni got to feel her father’s heart as a pulse running through Thomas’ wrist. Jeni’s wedding was the next day. Thomas got the okay from his daughter, and the rest is history. "First person I'll ever be walking down the aisle," Thomas says. You can see a video report at WPVI News.